Built in 1967 as a 45,000 seat facility for the University of Tampa, Tampa Stadium was also known as Houlihan's Stadium. A major expansion in 1974 increased seating capacity by 27,000 after the NFL awarded an expansion franchise to the city . 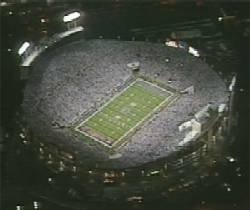 When the Buccaneers debuted in 1976, it was one of the largest stadiums in the league. Tampa Stadium was considered state of the art when the Bandits arrived in 1983. In 1984 it had the distinction of hosting two different professional football championship games, with Super Bowl XVIII in January followed by the 1984 USFL Championship Game in July. The NFL would bring the Super Bowl back to Tampa after its 1990 season, awarding the city Super Bowl XXV. The Bandits departed the scene after the 1985 season, but the Buccaneers continued to play in the facility through 1997, when new team owner Malcolm Glazer began a new era for the Bucs - complete with a new stadium, new helmets and new uniforms. In 1999, the stadium which ESPN personality Chris Berman had dubbed "The Big Sombrero" was brought down, converted into a parking lot for the Buccaneers new stadium, which had been built adjacent to Tampa Stadium.